If you’re a fan of the movie “Galaxy Quest,” you’ll remember the lovable aliens mentioning that their organ fabrication lab was nearing completion. That was, of course, science fiction. Organ fabrication is something we’ll never see in our lifetimes, right? Actually, that may be very wrong. Organ fabrication, or something very like it, may be closer to becoming a reality than we think. Engineers at the University of California in San Diego have recently developed a technology that uses existing 3D printing techniques to make microscopic structures from a gel that is compatible with living tissues. Right now, these structures can be used for growing and studying cells in a laboratory. In the future — and this is the exciting part — doctors will be able to print out living tissues in seconds. If someone needs a skin graft, for instance, his doctor will simply order the tissue from the 3D lab right there in the hospital. If that same patient needs a kidney, it can be printed out as well. The actual process, first reported in the Advanced Materials journal, is called dynamic optical projection stereolithography or DOPsL. It was first developed by UC Professor of Nanoengineering Shaochen Chen. The challenge that Professor Chen faced was the microscopic scale of human tissues. 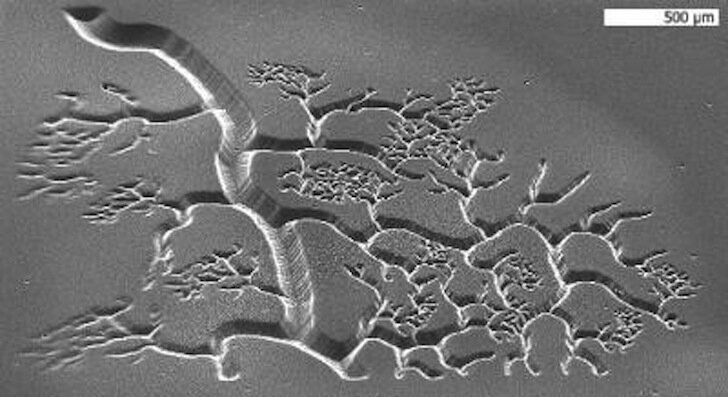 Other 3D printing techniques, like those being used for making car parts and hand tools, simply couldn’t make structures on the microscopic scale that Chen needed for his project. He needed a technology that would print structures as small as the finest human blood vessels. Without that ability, the regenerated organs that were to be created would not have the vascular system they would need to survive, and the whole idea of organ regeneration would have to stay right where it started: in the realm of science fiction. Chen’s technique uses a computer to project light through a precision system of micro-mirrors onto photosensitive hydrogel. The light causes the gel to solidify in microscopic layers turning it into just the precise, delicate structure required to mimic human tissues. Chen’s project is being funded by a four-year grant from the National Institutes of Health (NIH). His $1.5 million grant is part of the Obama administration’s billion dollar investment in advanced manufacturing technologies. These investments also include the creation of a funding organization called the National Additive Manufacturing Institute. This organization is charged with distributing 30 million federal dollars focusing on the development of additive manufacturing. This is good news for scientists like Professor Chen because the term additive manufacturing refers to any technology that builds products by layering. In other words, the organization funds 3D printing technology research. Federal funding plus innovative scientists make a great combination. Those organ fabrications labs, it seems, are just around the corner. Image Credit: Biomedical Nanotechnology Laboratory, Chen Research Group, UC San Diego Jacobs School of Engineering.